Scale is the proportion of the model to the real item (prototype). Gauge is the distance between the rails measured between the inside faces of the rails. There are other scales and gauges but the above are the most popular. The model gauge is that which is equivalent to the prototype standard railway gauge of 4 ft 8 ½ inches (1435mm). There are also models of prototype narrow gauge railways such as the Puffing Billy in Victoria. This is called HOn30 and has a track gauge of 9mm the same as N scale for a prototype track of 2 ft 6 inches. Prototype is the real railway that is being modelled and sometimes includes a specific period of time. For example, a person may be modelling trains that operated in New South Wales. If the person was modelling the time between 1945 and 1975, they would be modelling the NSW Government Railways. From 1980 to 2004 the railway was operated by the State Rail Authority of NSW with freight trains in the latter years operated by FreightRail or FreightCorp or Pacific National or National Rail Corporation. Similarly, a person modelling railways in the USA may choose to model Union Pacific (UP) or Burlington Northern Santa Fe (BNSF) or one of the other many railways for which models and prototype information is available. There are quite a few modellers in Australia who model from British or European prototypes because of their previous attachments to these locations. The following hints will help you get started on your first layout. 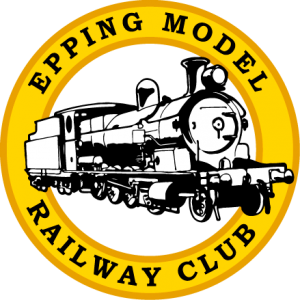 For more information read the Australian Model Railway Magazine, the Kalmbach books for Model Railroaders and come along to the Epping Model Railway Club – SCMRA Open days in January, July and November each year. The easiest way to get started is with a permanent baseboard, track and scenery. In HO scale this can be as small as 1.8m x 0.9m or 2.4m x 1.2m. These are both standard sizes of plywood. This is best supported with a frame of 70mm x 20mm DAR Maple or Radiata Pine timber with 1 or 2 cross braces. Tracks can be laid directly on the board or onto 3mm cork strips that have been glued to the board. Before laying the track, seal the plywood with an undercoat paint and a colour coat of say brown. Pins are the easiest method of fixing the track. It is best to pre-drill a hole for a pin. Track pins are available from your train hobby shop. Drill the hole to about half the depth of the pin with a fine drill. Use a nail punch to hammer the pin to its full depth. The basic scenery areas should be drawn on the board. Roads, etc can be painted onto the board. I also paint the cork grey to represent the ballast. Grass mats, level crossings, stations, houses and factories can then be added. The electrical wiring should be fixed above or below the board. Meeting AddressEpping Creative Centre, Dence Park, 26 Stanley Road, Epping NSW. We have many activities and events. See the about page for more information.